TowXchange offers a complete suite of integrated solutions allowing Municipalities and Law Enforcement agencies to connect with private and contracted towing providers. 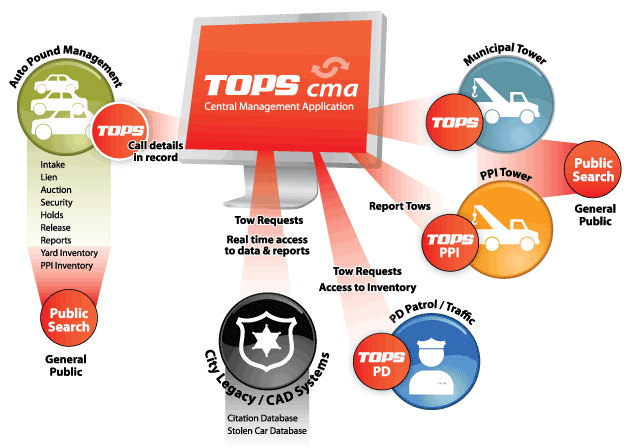 A unique set of software tools allow full Transparency, Efficiency and Accountability for all aspects of municipal towing. Our tools can also integrate with City legacy and CAD systems to offer a seamless connection between the Municipalities, contracted tow operators, impound management and your citizens. Feel free to reach out to us to discuss your current situation or to request a demonstration of our products.